In 2008, I moved back to Texas after living some 20 years on the East Coast. Eager to contrast the two cultures, I did not always find the differences I expected, but on the matter of guns I was not disappointed. Apart from occasional references to hunting, my East Coast conversations had rarely revolved around guns. I didn’t know of anyone in my neighborhood just outside Philadelphia who even owned a gun, much less wanted to talk about firearms. Doubtless the story was different in Philadelphia proper, but even there the dominant urban Democratic culture had long since embraced gun control, and educated opinion, for what it was worth, took the same side. Here in Houston, by contrast, guns seem to be an almost daily topic of conversation, among all classes. I have brought little more than Yankee ignorance to these discussions. “I used to be a native Texan,” I recently told my gun-owning neighbor, apologetically. Of course, there had always been a gap between myself and many of my fellow Texans. I did not grow up in a gun-owning household. There were seven kids in our family, and my father made a decision early on that guns among so many children would raise more difficulties than they were worth (the guns, I mean). By my college years I had something of an East Coast attitude toward guns before I had even set foot on the East Coast. As a student at The University of Texas at Austin, I remember remarking to a female friend, “When I think of guns, I think danger.” She replied, “When I think of guns, I think safety.” She kept a loaded pistol under her pillow at night. One of the great underdiscussed themes in the gun debate is the use that thousands of women make of guns as potent equalizers in their otherwise unequal encounters with bad men. We are now some six months from the Newtown shooting, though it seems much longer. There has been no significant change in gun laws, nor in the way children in our schools are protected from gun violence. The Democrats proposed background checks at gun shows, an assault weapons ban, and limits on magazine capacity. They failed to secure enough votes in Congress. The National Rifle Association (NRA) proposed federal funding to hire armed police officers for the protection of children in our schools. Gun controllers responded to the proposal with disbelief and scorn. That response interests me. Clearly, gun controllers were appalled at a proposal that seemed to simply divert public attention from their own solutions. But there is a deeper explanation for their response. Many Americans–including many public school administrators and teachers–envision our schools as pristine paradises; as places at least potentially untainted by the evils of the world; places where a new more perfect world can be incubated and grown, in the hearts and minds of schoolchildren.Vice-President Biden himself recently spoke of schools as “sanctuaries.” In this view, children can be separated out from the evils of the broader society and taught as innocent blank slates in the school’s protective, nurturing environment. Thus formed, the children can then go out into the world and make it more like the paradise they experienced at school. The whole society can become as gentle and nurturing as Loving Sweet Elementary. For opponents of the NRA proposal, guns in schools spoil this project. 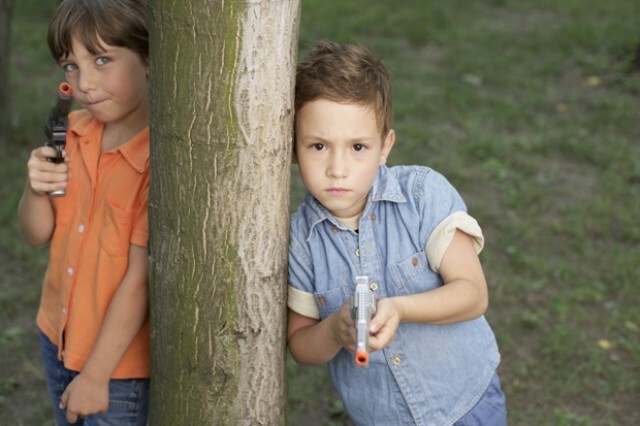 Guns in school would teach kids that guns are a necessary part of normal human society. Guns in schools, even if only on the holsters of security guards, would dangle before young imaginations like the forbidden fruit in the Garden of Eden. The kids would imaginatively grab that fruit and spoil any chance of paradise, in school or out. I have great sympathies with the political tradition in which this view originates. “School perfectionists” are heirs to the moral reformers of the early nineteenth century–men and women who recognized the dangers of alcohol consumption and the inhumanity of slavery. They are heirs to the progressives of the early twentieth century, who worked to improve working conditions in the sweatshops and steel mills and who saw schools’ potential to assimilate waves of immigrants into American life. The belief that a society is capable of substantial moral betterment has enabled the United States to become a better country. But this perfectionism has always threatened also to lead us down blind alleys and to cause us to lose the partial but very real goods we already possessed. There is nothing wrong per se with a proposal that armed guards be posted at every school. There is much that is very right about it. It is a proposal that should not be laughed out of the gun violence debate. It would not prevent all school gun violence, to be sure, but it would probably deter and limit some of it. Schools are not Gardens of Eden. The children in them, already flawed little Adams and Eves, deserve our protection more than our perfectionism. Schools should arm up. I can’t help but think that eventually we will see many more armed security guards and police officers patrolling our public schools than we do today. The only question in my mind is how many children will be killed, and how many schools sued, before this change takes place. The home I grew up in was gunless. But I’m sure if my father had felt gun violence to be a pressing threat, he would have armed up. And if he had had the financial means, he would have hired an armed sentry at our door. Why should our schools, which spend so much money on so much else, not spend on this as well? Are we really, once again, living in the wild west in this country? Very sad. I don’t know. Hopefully not. But large gatherings of people, especially defenseless young people, need protection. Even strict gun control laws are not sufficient, or at least they are not all we can do. One of the difficulties here is that school districts are hard to sue. As creations of the states, they share in the states’ sovereign immunity unless a state explicitly makes them suable. I was initially impressed to believe this was just another rant against guns. But I read the whole thing through, and that was not exactly the case. You clearly display your initial biases (and we all have them), but you also displayed a real ability to reason about things instead of just reacting. Guns are just things. How you feel about them is largely a product of what you have learned about them, or not learned about them. Guns can be used for good or evil. They are just things, unlike people who can choose good and evil. Now that you are in Texas, do you have any idea when you go to the mall, or walk about the streets, or possibly even go to church, how many of your fellow Texans are carrying a loaded and concealed handun – legally – on their person? Some day you may be going along and nod at a nice friendly looking grandfather type – like me – and not realize there is a loaded Glock semi-auto pistol in a holster hiding below the innocent looking, but loud and ostentatious Hawaiian shirt. Or it might be a woman with a hipster looking fanny pack with a loaded Smith & Wesson “snubbie” revolver jogging along the trail by Town Lake in downtown Austin. People, like myself, who have lived with guns all of our lives are like the lady in your story – we see “safety,” although we are fully aware of both the possibility of criminals using guns, or even a friend or relative taking their own life with a gun. Bad things do happen. But having surveyed the landscape of human possibility and human culpability, some people choose to not be willing victims of evil and we take responsibility to see that that “thing” is used – in our hands – only for good. We can’t take responsibility for whatever everybody else does, and we are not convinced ethically, or morally, that we have the right to compel everyone to adjust to our views, or follow our road. Thanks for this comment. I was at a party recently where it was pointed out to me which of the male guests were probably “packing” (don’t know about the women!). It made me a little uneasy, but it was clear that these guys were not about to break out into gunfights. Obviously, thousands of Americans use guns responsibly, day after day, year after year. My impression is that gun controllers have trouble believing this is so. Many of them simply lack (as I do) direct experience of this sort of gun-owning, law-abiding culture. So they can only envision two groups – law-abiding gunless, and irresponsible/criminal gun-owning. Thanks for a very balanced piece. As someone who has never fired, much less owned a gun, I also found the cursory dismissal of armed police or security personnel in schools to be strange. I heard critics dismiss it as ‘insane.’ Is it less than ideal? Sure. Insane under the circumstances? Hardly. Your rationale for why critics feel this way is insightful and hadn’t occurred to me before. I was also struck by this line: “One of the great underdiscussed themes in the gun debate is the use that thousands of women make of guns as potent equalizers in their otherwise unequal encounters with bad men.” Very well said. The media gives the impression that most women, and especially those who identify as feminists, are opposed to guns and in favor of gun control. That isn’t the case in my experience. Perhaps the women I know are an unrepresentative sample, but the conversation is worth having. I agree with “Very well said.” It is amazing how an encounter with evil – that which cannot be reasoned or argued with – will change a person’s attitude very quickly. Some years ago I temporarily loaned a 12 gauge shotgun to a lady friend who was being threatened (to keep in her home), and then took her to a gun show where she bought a Glock 9mm pistol (with a background check, which all licensed dealers always do, even at gun shows despite popular news mis-reporting). Smith & Wesson certainly recognizes this phenomenon. They introduced a model some years ago called the “Lady Smith,” a version of their snub nose revolver line. Another really “undiscussed theme in the gun debate” is the frequency with which people actually use guns in self defense. I honestly don’t think anyone really knows, and if you think about it you will realize it is extremely difficult to determine. The fact seems to be that something like 99.99% of the time a gun is never fired in a self-defense scenario. The threat an armed victim presents to the aggressor usually solves the problem. But in many places in this country people are not going to report such an incident to the police because they may be more likely of being prosecuted than the aggressor (e.g., NYC or Chicago), and many people are disinclined to deal with the police unless out of the direst necessity. An even more undiscussed theme is whether most people with guns are actually capable of using them. I am not talking about training or ability to use a weapon effectively. I am talking about the actual ability to deliberately take the life of another person. Lt. Col. Dave Grossman – an Army psychologist – has studied this quite a bit and has concluded that most people, perhaps 80% if I remember correctly, cannot kill another person on purpose. So it is a very good thing that the threat of being armed is so successful a strategy because a lot of people could not actually fire those guns in self defense, not due to lack of ability, but due to lack of something else (which fact may give some hope of human progress). Grossman’s book “On Killing” should be a mandatory read for anyone really interested the subject of self defense. Thanks for this fine comment. With so much crime out there, I think it would raise a serious question of justice to make it difficult for women to conceal-and-carry. Dr. Joseph, I thoroughly enjoyed your post. In response to the “wild west” comment, owning and carrying a weapon doesn’t mean we’ve reverted back to a time synonymous with lawlessness and chaos. I am in favor of armed security guards in our schools. I am a parent and I am a woman…I am also licensed to carry a concealed weapon. I believe it DOES level the playing field when faced with an attacker. I barely clear the five foot marker, I would not pose much of physical threat if left to my own strengths; however when I’m armed–it’s a different story. I’ve had tactical weapons training. I’ve had classes, and I go to the shooting range regularly. Guns are not toys, nor should they be thought of as such. They are a last resort. I have three children and a husband who travels most every week. I also sleep with a loaded pistol under my pillow when my husband is out of town. I will protect my children. As for the guards in schools–I pray that the teachers that my husband and I have entrusted our children to would protect them just as we would. If that means arming the teachers, so be it. The school shootings are not a result of the accessibility of guns. They are the result of mentally ill and deranged individuals that have gone unchecked. Normal and sane people do not wake up one morning and murder fifty people without prior warning signs. Guns are not the issue. People are the problem. Trying to remove the right for law-abiding citizens to protect themselves will most certainly NOT solve the crime rate in this country. The last time I checked on the crime statistics, criminals didn’t put much stock into our laws which is what makes them criminals in the first place. No one will force you to own a weapon; that is the beauty of this country. You do not have to agree with your neighbors. The irony of that is that it will most likely be your gun-owning neighbor that will defend and protect you when the need arises on your property, though.